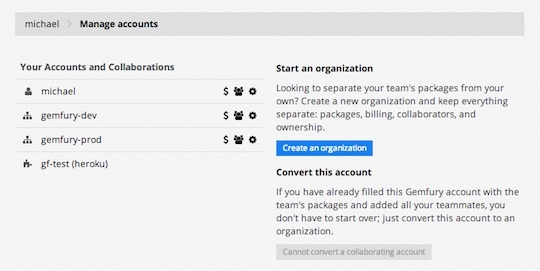 By creating an Organization account, you will decouple your team’s code from any individual member. All the packages, billing, ownership, and access will be centralized and controlled within your new Organization account. Furthermore, unlike Personal accounts, you will no longer be compelled to share your password to share administrative duties - an Organization can be administered by one or more owners just by switching the context of your new Dashboard. Personal accounts have offered the ability to open your account to a few colleagues; Organizations take this a step further. Download-only is the most basic level of access that allows the team member to download and install packages from your account. Upload/Download is for those tireless developers who move your code base forward. This level is for both uploading and installing packages. Owner is the highest permission level reserved for administration of the account. In addition to having full Upload/Download capabilities, Owners can update settings, payment plan, and manage collaborators. Our early Organization users have discovered a multitude of ways to use these new permission levels. Consultants use Download-only to allow multiple clients to use packages across projects without interfering with each other. Large businesses, on the other hand, use Download-only accounts to create dummy/bot collaborators to limit and control access when distributing a secret Repo-URL within their organization. Organizations is an easy way to compartmentalize your work, but participating or managing many projects doesn’t need to be overwhelming. That is why we are introducing the Manage Accounts page that gives you a single-glance overview and a fast way to dive into any part of any account. You can also use it to create new organizations or to convert an existing Personal account to an Organization, if you have already adopted Gemfury for your business. Don’t worry, all packages and collaborators will be kept through the conversion. In order to really make Organizations a team-oriented way to use Gemfury, we are providing all Organization accounts with no collaborator limit - go crazy! Instead, these accounts are priced by the number of packages you upload starting from $25/mo for 10 packages. This will better suit our business customers and keep allowing us to innovate on Gemfury for both team and personal use.